1036 N Allen Road Kimball Twp, MI. | MLS# 219008443 | Marine City and Algonac homes for sale,Westrick Real Estate One 810-765-8861, Marine City MI Homes,Real Estate Marine City MI,Homes for Sale Algonac,Algonac MI Agent, Home for sale St. Clair MI,St. Clair Homes for Sale,Property Marine City, Algonac Homes. 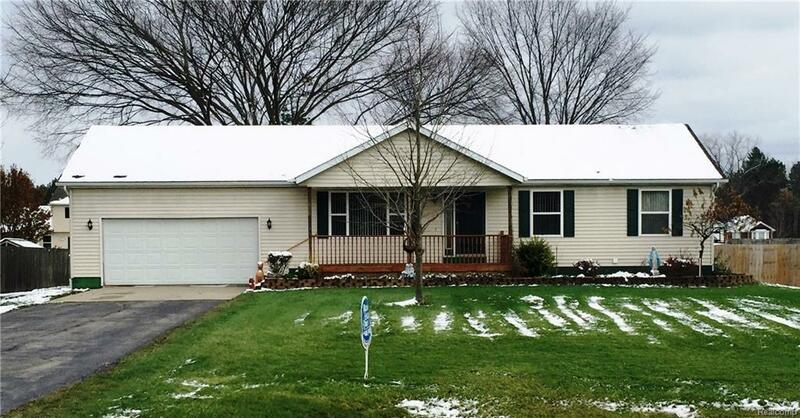 Kimball Township, Here's a chance to have a move in ready home with immediate possession. Sharp Kimball Twp. 1144 s.f. three bedroom one and a half bath ranch. Stove and refrigerator new in 2013, newer carpet, newer water heater and roof. Bedroom TV on wall can be included. Other items in house negotiable. This house is move in ready. Full basement has Egress window and could easily be finished into a bedroom, bath and family room currently has laundry room and plumbed for a bathroom, two car attached garage. Cement slab towards rear of property for shed or an extra patio area. This home has been well cared for. The new dishwasher is the silent stainless steel interior BOSCH. Deck has a gate to keep the pets contained. Show and sell this one today. Country atmosphere on a paved road! Seller will consider all reasonable offers. Make your offer today.